Lifestream Natural B-Complex is a unique wholefood powder sourced from high quality Quinoa sprouts. This special patented formula provides the full spectrum of bioavailable B vitamin complexes to ensure optimum use and absorption by the body. Quinoa sprouts taken in a supplement powder form can give you all the benefits of this Superfood in a quick, convenient, tasty powder that can be sprinkled over food or mixed in a glass of water or juice. Studies suggest that the bioavailability of natural food complex B vitamins is better than that of isolated synthetic vitamins. It is therefore preferential that Vitamin B nutritional complexes should come from food or from supplements which are as close to food as possible. Each 2mg serve of Lifestream Natural B-Complex provides the equivalent nutritional value of eating up to 4kg of Quinoa (4400cals). 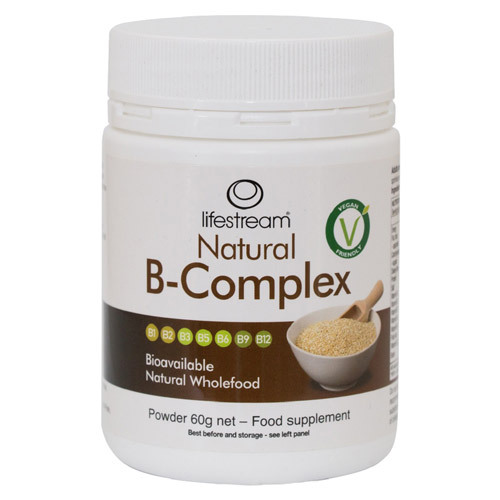 Lifestream Natural B-Complex is an excellent source of B vitamins which support your daily dietary intake. This contributes to the normal healthy function of energy production and metabolism, mental performance and the nervous system, immunity, hormonal activity, the structure of skin and hair, and blood formation. Suitable for vegetarians and vegans, gluten free, with no artificial additives, fillers, preservatives, colours or flavours. Adults and Children 12+: 2g daily. Children under 12 years: 1g daily. 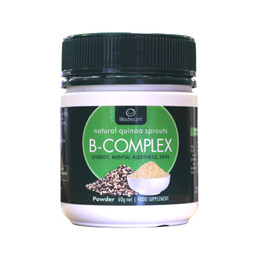 Below are reviews of Lifestream Natural B-Complex Powder - 60g by bodykind customers. If you have tried this product we'd love to hear what you think so please leave a review.